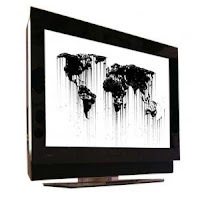 Manufacturers are using a tenacious greenhouse gas, nitrogen trifluoride (NF3), to build flatscreen TVs, and it's output is four-times worse than expected, reports New Scientist. Initial estimates predicted 1,200 tons of NF3 (which is 17,000 times more effective at warming the atmosphere than an equal mass of carbon dioxide) were floating around in the atmosphere. But a recent Scripps Institute study finds 5,400 tons of NF3 is out there. Manufacturers started using NF3 when the Kyoto treaty began regulating perfluorocarbons (PFCs). Instead of finding a more responsible way of making flatscreens, manufacturers went out and found something Kyoto didn't cover. If this is going to be the way climate policy works, a cat-and-mouse game between business and government, Pound360 is worried it will be too late for meaningful action by the time government identifies ALL harmful gasses. Perhaps all chemicals should be illegal for use in manufacturing until they're cleared by an international committee.